There is a suburb in Durban called Kloof. 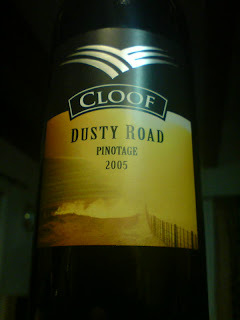 It is the Afrikaans word for cliff but it is pronounced cloof and not at all like the Afrikaans pronounciation. In fact a few years ago I stayed with a good friend of mine at his inlaws in Kloof and on a supply run to the local Spar we were calling it by its Afrikaans name and the locals were starting to organise a lynching party. The wine is quite nice, smooth and refreshing. I picked up some pepper on the nose and a good fruity flavour. Don't quote me on the flavours or the aromas, I usually get the opposite of the labels.